Durian season is drawing to a close, but the demand for the seasonal fruit is still going strong, if this durian festival is any indication. Teo Ser Luck, former Minister, organised this year’s Durian Festival with the Sengkang Community Club. The event happened last Saturday, at the Sengkang Community Club Hardcourt, just like previous festivals. 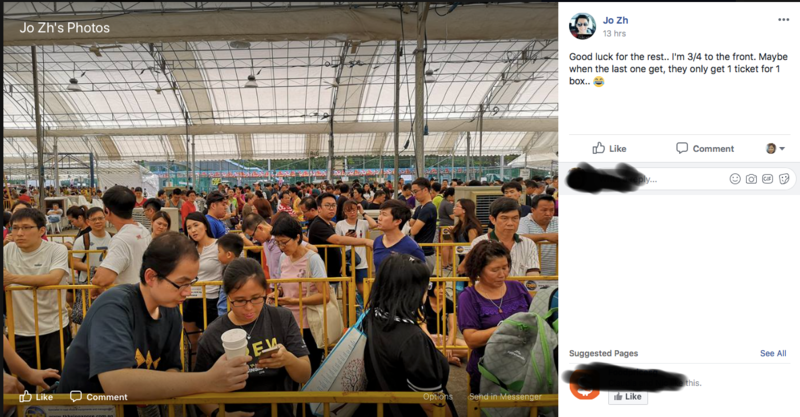 With a larger number of ticket sales this time compared to before, organisers were supposed to be ready to give these people two boxes of durian for each $5 ticket they buy. According to the event poster, citizens were allowed to buy at most two tickets each. This event has been a regular occurrence every year in this locality. 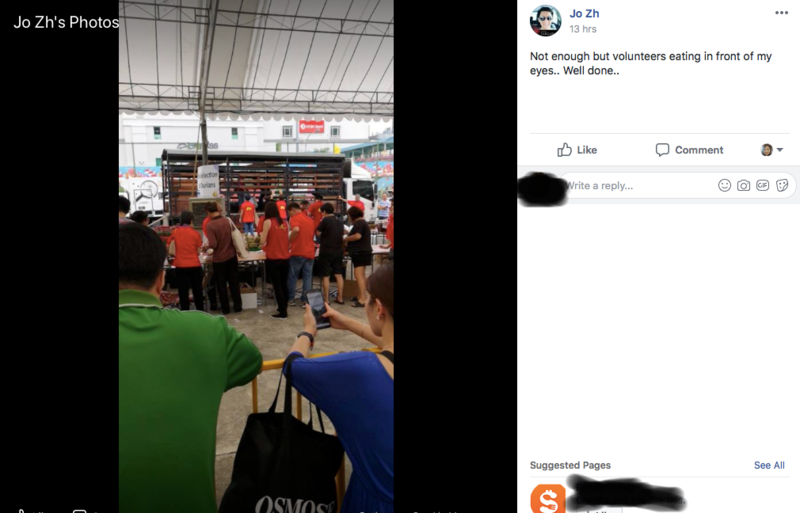 While lines were expected, people knew that the organisers should have been veterans about making everything go smoothly. 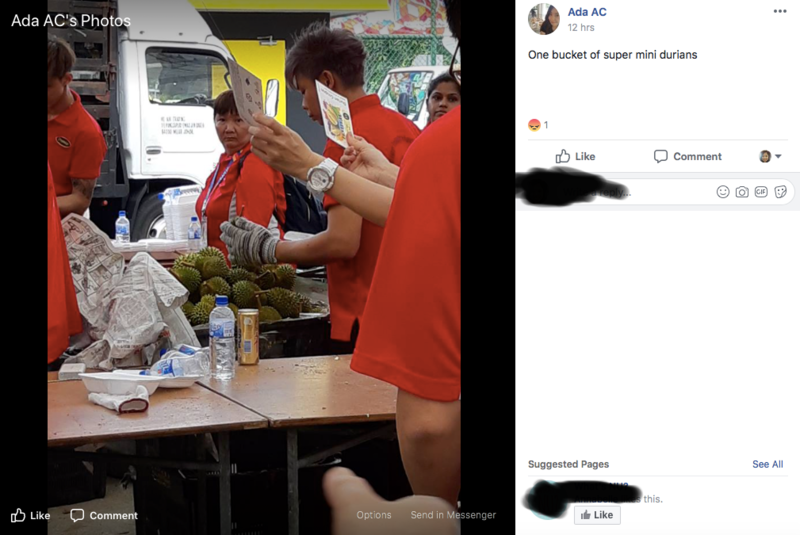 Photos and comments on the official event page showed that this event turned into a durian-lover’s true test, where long lines did not equal the quality of the durians distributed. Other people posted that the people at the front of the line could see that the people at the end might not be getting any fruit. Just look at that line. 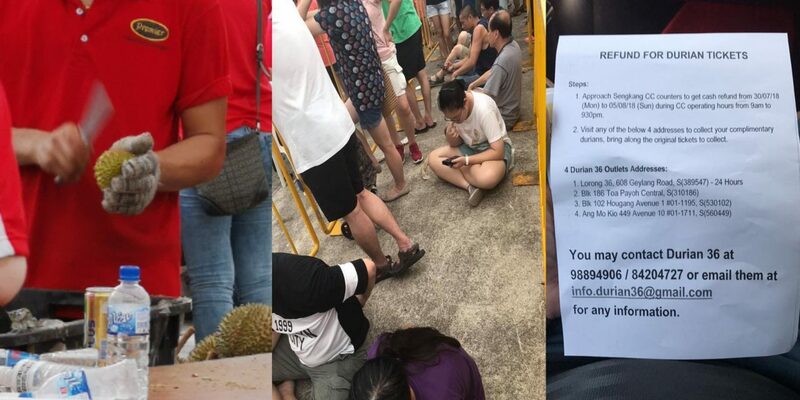 At some point, the suppliers started breaking the durians open to accommodate the number of tickets. Some of the supplier personnel were eating the durian too. Some refreshments were provided to the people in queue, but with a four-hour wait for some, that’s hardly enough. 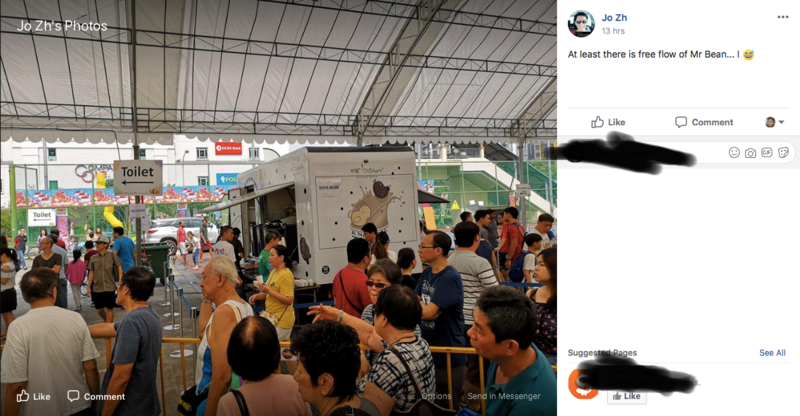 Some people were lucky and got good durian, and said that they went to queue early. 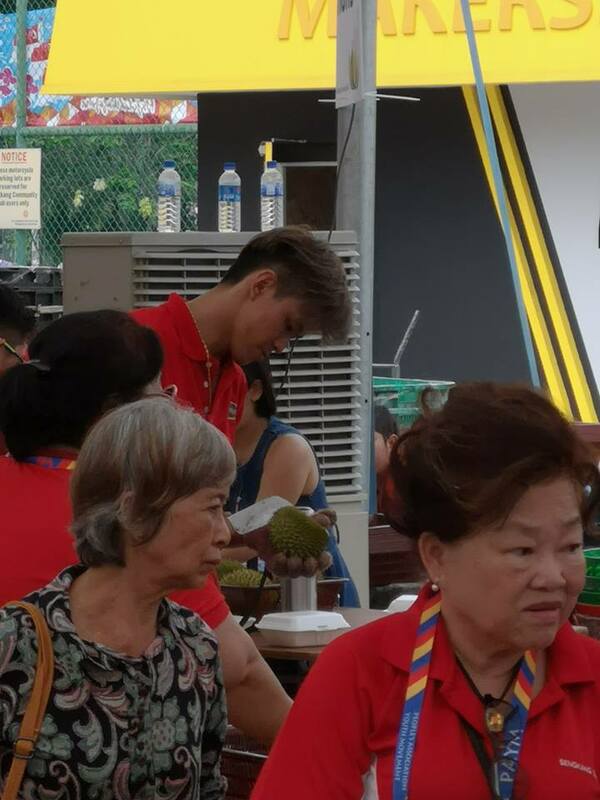 As for the size of the durian fruit for the people who didn’t queue early, they had “oversized rambutans” as some netizens called the tiny apple-sized things still being opened. This one is even smaller. There seems to be a bunch of them. As the day went on, the quality of the durian deteriorated until even these duds weren’t available! But with that size, who would want to pay $5? Even the small ones were cut open to try to give the ticket holders something to take home. We doubt this is something that they expected from the event posters and previous experiences. 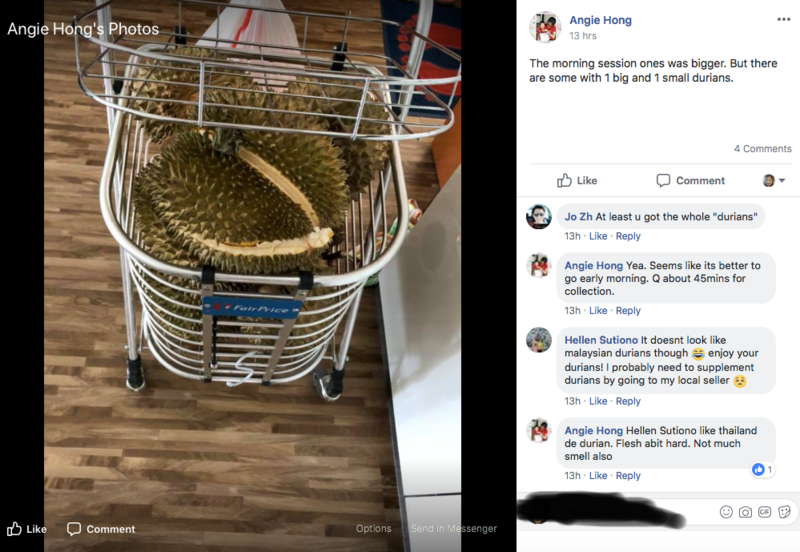 Some people were asking who was ultimately responsible, Teo, or the supplier of the durian? 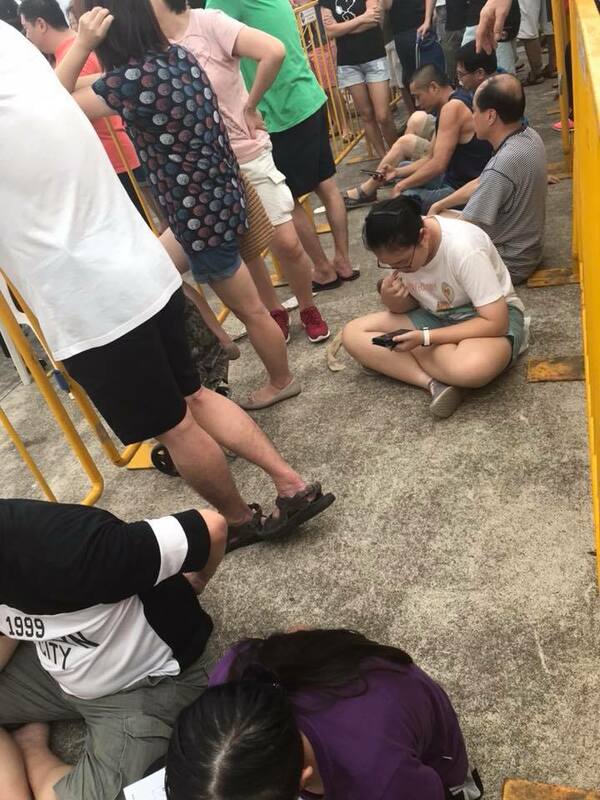 Some also saw that when people were no longer given any durian, there were some allotted to unknown people, and that the ticket holders felt this was very unfair especially after queuing for so long. Last year, though, things went much more smoothly and the durian quality was much better. Predictably, people wanted their money back. At the site, when there were no more durians to give, the personnel gave these instructions to the people still in line. 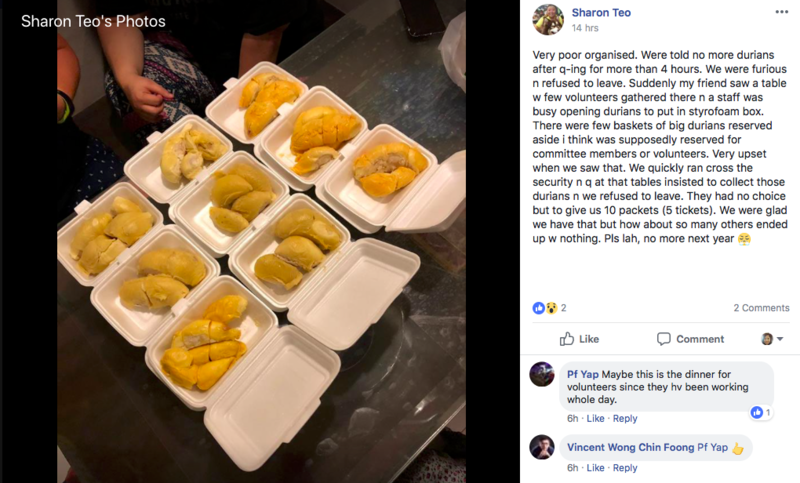 The organiser, The Sengkang Community Club, has issued a statement on the matter, which includes an apology and details on how to avail of refunds along with complementary durian from the supplier. Does this mean more of the oversized rambutan?! 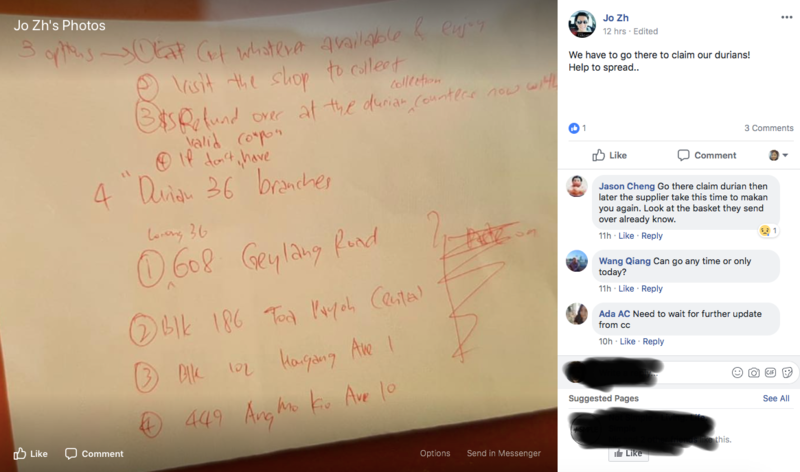 1) Kindly approach Sengkang CC counter to collect your cash refund from tomorrow onwards. 2) Visit any of the 4 addresses below to collect your complimentary durians, please bring along your original tickets for collection. However, as the durian season is ending, we would like to seek your kind understanding to contact the vendor before heading down. Please be assured that the tickets will still be valid. What do you think of this event? Would you be going to a durian festival next year? Let us know in the comments! NextDavid Gan is calling who a “public toilet” now? 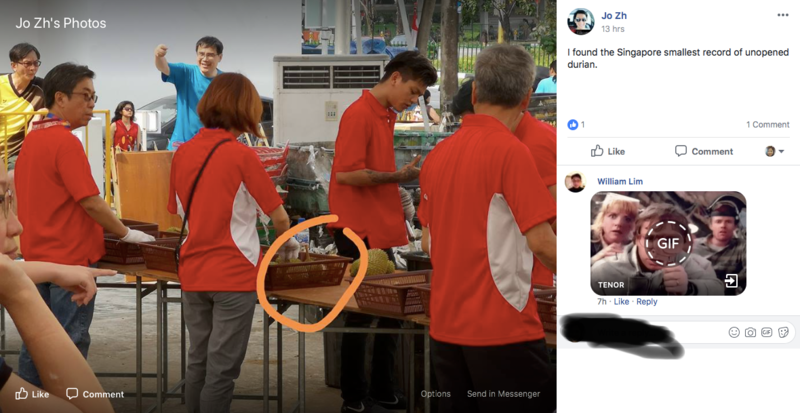 This Durian Festival event is totally a flop. 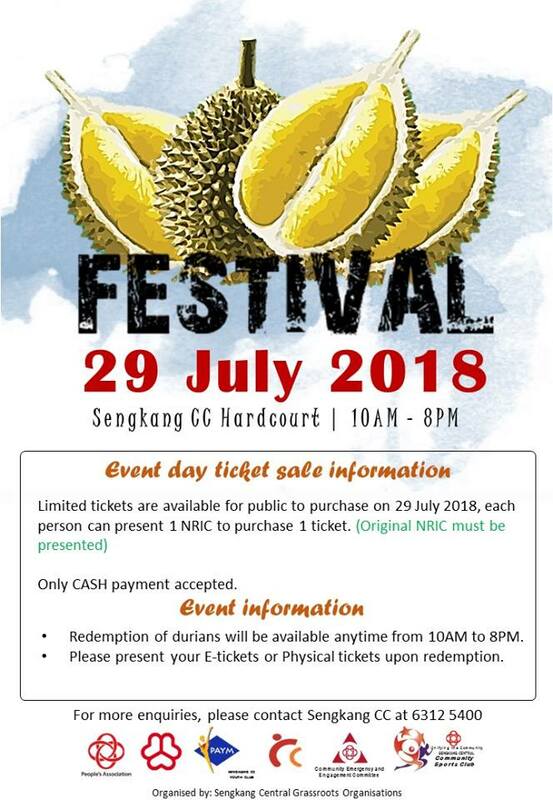 The organiser Sengkang Community Club based on the past two years of successful organising the Durian Festival has become more ambitious to create a bigger event. But they are resting on their laurels not checking whether the Durian supplier able to cope with the demand. They should have engaged two to three suppliers instead of relying too much on one sole supplier. This is a lesson learned never put too many eggs in one basket. 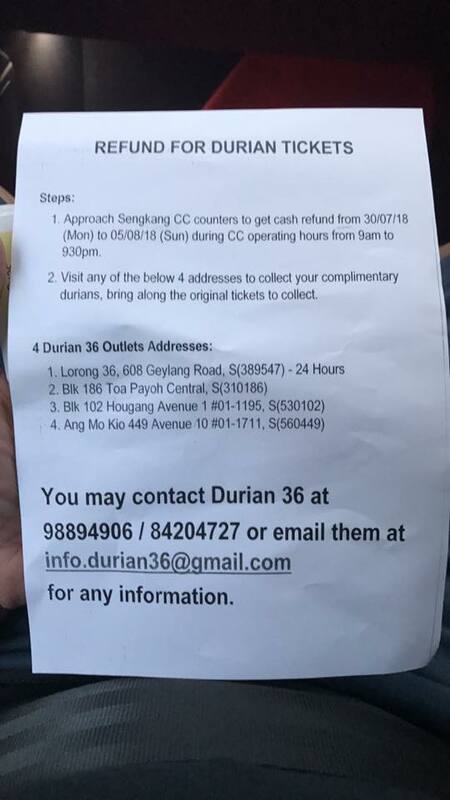 For those residents who have not collected the durians still get refund and collect from the durian outlets. 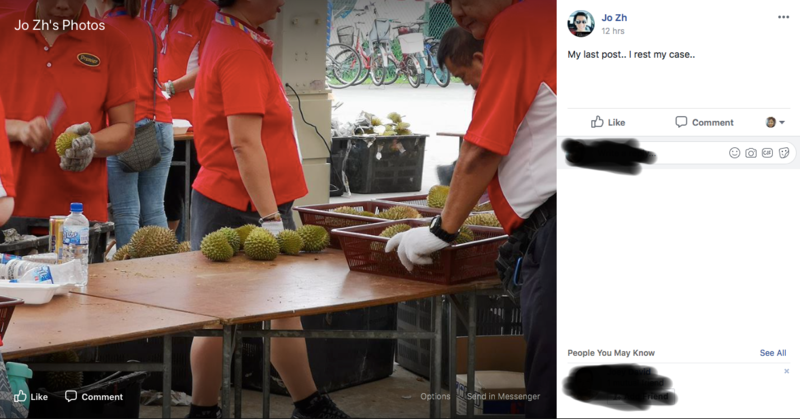 What about those residents who collected those poor quality durians, will they be compensated?If they will to organise another Durian Festival next year they must have assurance to residents that no more such disaster will occur again. I don’t think I will support this event.